In South America, Alpacas were a cherished treasure of the ancient Incan civilization and played a central role in the Incan culture that was located on the high Andean Plateau and the mountains. Alpacas are now being successfully raised and enjoyed in many countries of the World. There are two types of alpacas - the Huacaya (like woolly teddy bears) and the Suri (with the dreadlock look). The lifespan of the alpaca is about 20 years and the gestation is around 11.5 months. Alpacas eat grasses and chew their cud. 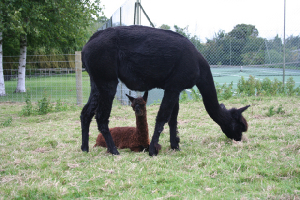 Adult alpacas are about 36" tall at the withers and generally weigh between 60 to 80 kilograms. They are gentle creatures and are easy to handle. Alpacas do not have incisors, horns, hooves or claws. As they deposit droppings in only a few places in the paddock, they are easy to clean up after. They require minimal fencing and can be pastured at 5-6 per acre. Alpacas produce one of the world's finest and most luxurious natural fibres, and they are generally sheared annually. The fleece is as soft as cashmere and warmer, lighter and stronger than wool. Woven into material or processed into yarn, many fine garments can be created from alpaca fleece. It comes in twenty two natural colours and can also be dyed to a range of beautiful shades, and is now enjoyed by spinners, weavers and knitters around the world.